With the holidays right around the corner, many of you are probably gathering recipes and ideas for festivities with friends and family. I always like to test out my recipes before serving them so I'm not scrambling around the day of the event. Today I'm sharing a little recipe involving cocktails. I think simple syrup should be on every home cook's repertoire. It can be used for a million and one things and it doesn't take much work to make flavored syrups, like the Thyme Simple Syrup we'll be showing you for this drink. Simple syrup is just one part water, one part sugar. Easy as that! For this cocktail, we used Rhubarb Tea from Art in the Age. The rhubarb spirit is made from "a refreshing garden tea comprised of vegetables, herbs, and spices including beets, carrots, lemon, pink peppercorn and cane sugar. It's tangy but not too tangy. Sweet but not too sweet. Crisp and refreshing, but with a hint of spice." Check them out, they make amazing spirits in small, hand-crafted batches. Combine raspberries, Rhuby and simple syrup in a shaker and give it a vigorous shake. Strain over fresh ice in a highball glass or mason jar. Top off with club soda. 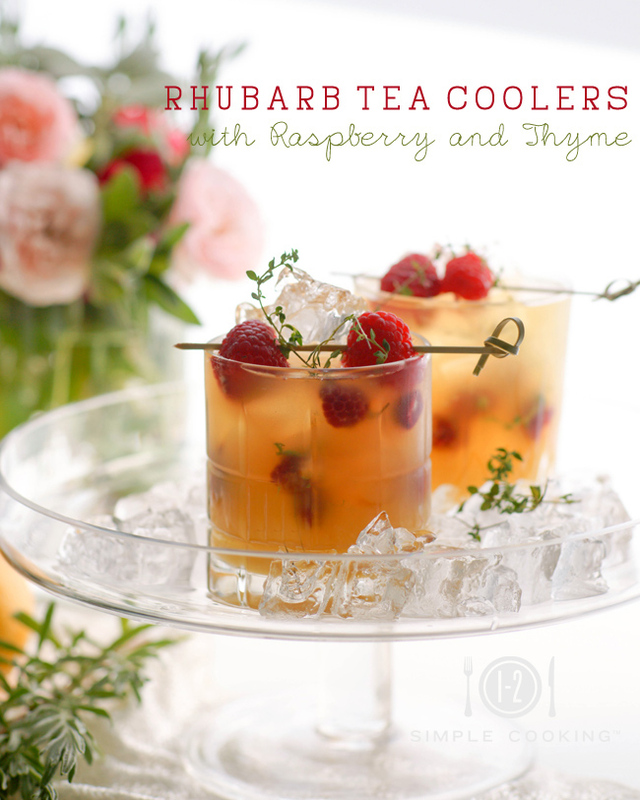 Garnish with fresh raspberries and thyme sprigs. Combine sugar and water in a small pot and heat over medium heat until sugar is dissolved. Remove from heat and add thyme leaves, stir until leaves are submerged. Allow leaves to steep for 10-15 minutes and strain into a glass tupperware container and place in the fridge until ready to use.